Yeah i call my build a war priest and i know its a very cliche and sounds like a holy warrior, paladin, combat mage, monk. Its all same to me cus i always played spellcaster in many rpg..
And my build is familiar to wadda stable but its not wadda stable, you'll see! Simply we can say its something hybrid. And now ill share it as a full guide and also with some tips and tricks..
Before the beginning i must warn you, you have to join Warriors Guild for this build, otherwise you cant use this build..
Dont worry its much more useful then Cleric Guild, of course for our build.. I do respect for other builds..
Anyways first lets start with skils. 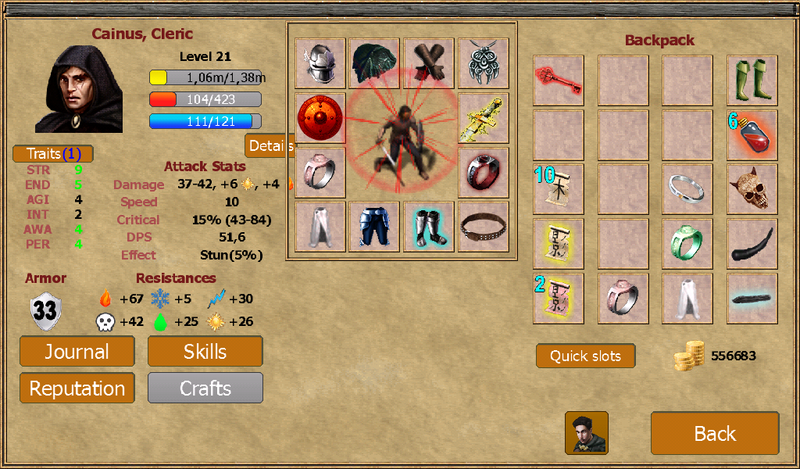 Certainly its our most survivability skill it can save you many time when you face the death get it to max lvl. If you reach to max level you will have a +12 damage(8 normal 4 fire) and also its working with duel and bloodlust its your dps boost even when you start the game at the beginning you can spend your all points to that skill, so get it to max lvl. Many people doesnt like this one so much and firstly maybe its looking a little bit overpriced. But with this build i can guaranteed its not. 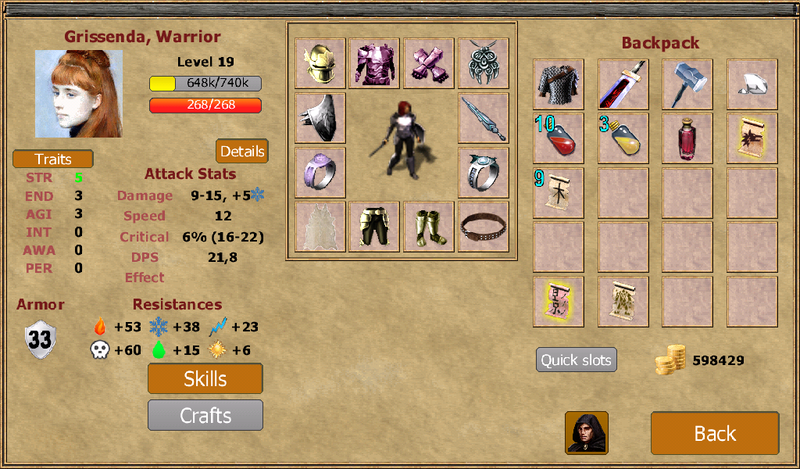 In my book, %5 stun is awesome for a spellcaster and +6 damage for undead is not great but hey its extra dps boost. do it max lvl. Be a cleric, warrior or whatever you need always armor. So this one is gives you +3 armor at max lvl and even extra +3 for undead. At the early game after the Arbenos might and heal wounds you can make it max lvl, so go go go, max lvl. Some builds spending only one point for it but i do not leave my job to chance. its awesome in dungeons, tombs and caves. You'll easly find all secrets only with some tricks and experience.. Get max level ofc. Its make your dps higher also gives you %150 critical chance increase at the max level of course criticals depends on your weapon but simply mine is %15 with my blade.. Get max level. This is our one of warrior skills too, with this were gaining extra +5 damage per attack. That means higher dps. Get max lvl of course. When you hit multiple times it gives you extra attack, its warrior skill but ofcs works with us well making level two is enough. Its insta-kill skill with some chances, of course better is at the max level but for now i just spend one point, of course when i gain a level ill make it max but for now just spend one point so level 1. Its addition for both dps and armor for a few seconds, its useful when you are fighting against multiple attackers but only one point is enough for any level..
and not have a much difference with level 2 and 3 so just get level 1. As you see my build is not only STR or AGI build, its both. I use the traits for much more balanced build. 6 STR is enough of course its not just extra dps, its survivability too. For healthy and long life for survivability also gives you +5 toxic resistance for each point. Extra armor and extra dps..
Its exactly mage trait but either we can get some mana with 2 point so i never say no for extra mana..
With 3 AWA you'll get a bonus +1 armor, and gossip bonus. Its our main trait, gives you mana for each level/point. As you see, mine is 5. Here is mine resistance table at level 21, but resistances not a big deal if you have a enough items for all elements. Im changing my items time to time. Unfortunately my gear is not done yet but some of them is ok, still i need some items but reason is just rumor bosses, i didnt get enough rumor even with %53 gossip. Anyway lets start. And only sword we can use, its came with last update. Thank you for that David. If you like to know, where can you get those items check the exiled kingdoms wikia..
As a companion as you see, i didnt choose Hirge. Reason is i have already self heal, if subject is dps and balance. I dont like so much playing with Hirge, but somehow if one day can implemented advanced skills for companions, im sure Hirge will be my favourite..
Im using Griss, she have a nice armor also dps. Its a simple tank build, shes so helping me with cleave, she is weaken enemies so i can massacre them. Im done for now i gotta sleep, of course as i promised ill share the gamestyle, tips, tricks and many stuff, but another day. Last edited by Cainus on Mon Sep 11, 2017 6:51 am, edited 11 times in total. Updated with companion choise, ill add much more stuff; Tips, Leveling, How to gain gold in a few days..
Nice one although I have chosen the pure cleric model for role-playing reasons and it works just fine. 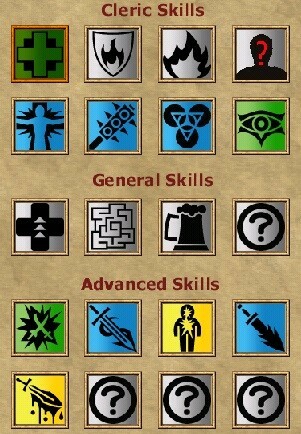 I have to admit that the exclusive skills given to a cleric are not that useful because they are not worthy of the cost in skill points although Turn Undeads allows to kill really powerful opponents at ease and it is like having "the world" ability from Jojo series! Let me ask one thing: why did you give Grissenda the Ushram wisdom charm? So far, I have seen that NPCs get really small benefits from intelligence or XP boosters! Sorry for my bad, ill gave the ss when i went to home. I wasnt online for a long time, nor did i played game. Im not saying my build is best but i can say i dont need defense potions I didnt like your attitude..
You're build is great Cainus, it make's playing so much easier. Thanks, yeah thats what im trying to get point ; balanced with between defense and dps..